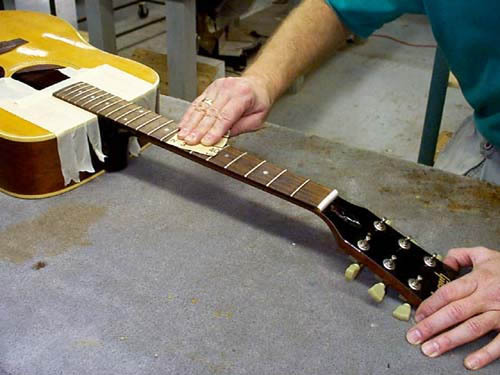 You can wipe down your strings and the neck of your guitar every time you play it. And you can change your strings every few days. But sooner or later, you're going to notice a funky, gunky feeling on the fretboard that won't go away no matter how much you wipe it down or change strings. The fretboard needs cleaning and the frets need polishing. It's one of the easiest do-it-yourself jobs in the guitar maintenance/repair handbook -- as long as you have the right tools and supplies. 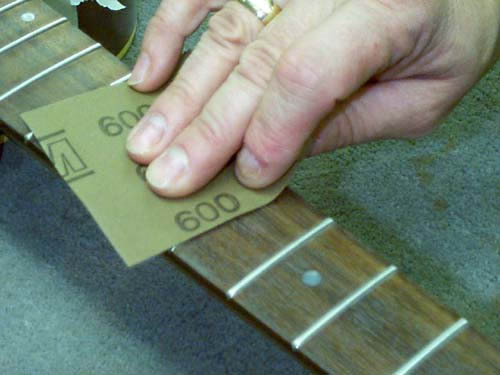 The following process applies to an open-grain type of fretboard, such as rosewood or ebony. 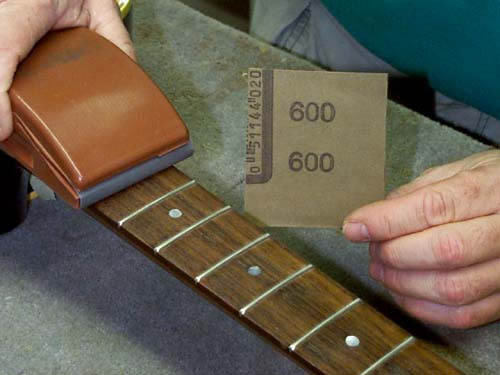 If you have a lacquered maple fretboard you must protect the lacquer during the fret-polishing process by taping over the fretboard between the frets. Cut the sandpaper into 2" squares. Protect the neck and the body by taping it off with masking tape. 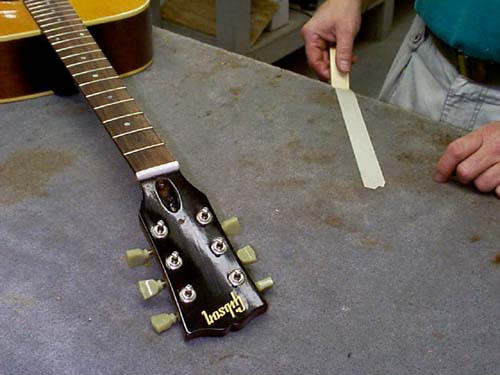 But before you apply tape to the guitar, apply and remove the tape from some other surface in order to remove some of the adhesive. This will make it easier to remove the tape from the guitar later. Now tape off the sides of the fingerboard and the top of the body where the neck extends over the body. 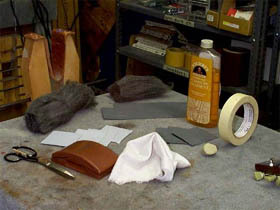 Begin polishing the frets with 400 grit sandpaper. With your hand moving lengthwise across the fretboard and over the tops of the frets, gently sand the tops of the frets, one section at a time until the scratches are gone from the frets. As the paper wears out, use fresh pieces until the board is complete. Repeat Step 4 using 600 grit paper this time. 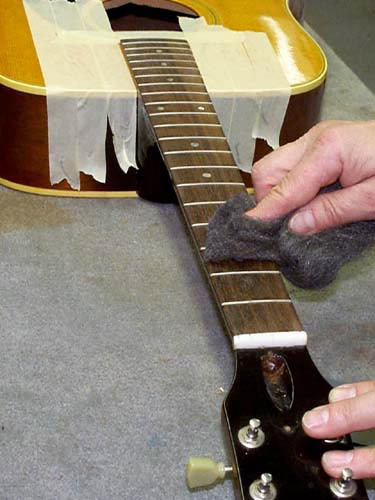 Clean the fretboard with steel wool, rubbing across the board parallel to the frets. Using the rubber sanding block with 600 grit sandpaper, sand the tops of the frets over the entire board. Check for any scratches and repeat the process if needed using fresh paper. Cut two pieces of cotton cloth to fit the rubber sanding block. Use a double-thickness cloth. 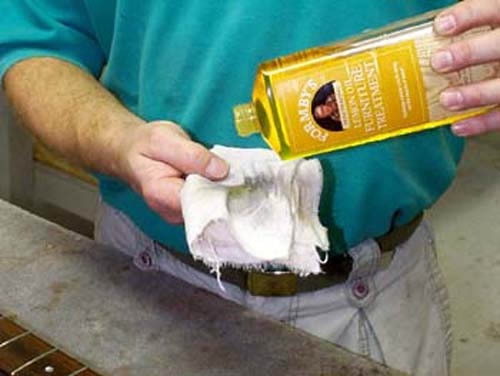 After it is in place on the block, rub the jewelers rouge or metal polish onto the cotton surface. Buff the tops of the frets until sufficiently shiny. Repeat if necessary. 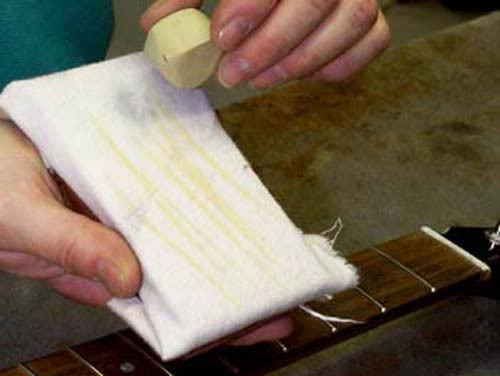 With another piece of cotton cloth, apply some oil to the entire fretboard. Let it soak in for about five minutes. 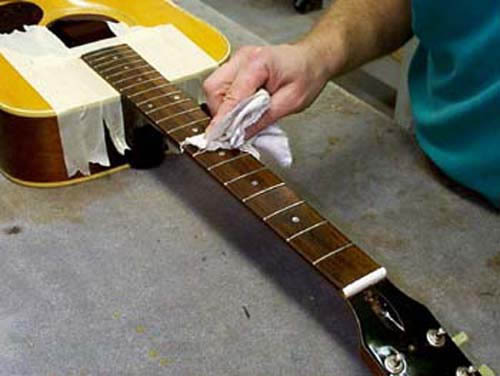 With another fresh piece of cotton cloth, rub off the excess oil and buff the frets lightly.